It’s breast cancer awareness month and pink ribbons are as common as pumpkins on doorsteps. Pink ribbons were first handed out in New York City in the early ’90s to build awareness of breast cancer and early detection. Today, the movement includes organized walks, foundations and NFL games played in pink. So why the hype each October? For starters, one in eight women will develop invasive breast cancer over the course of her lifetime, and it’s predicted that more than 200,000 new cases of invasive breast cancer will be diagnosed in 2012. In short, most of us have been touched by someone who has (or had) breast cancer. If you’re a woman aged 40 or older, talk to your doctor about why it’s important to be screened. While experts disagree on when and how often women should begin their mammograms, the American Cancer Society and American College of Radiology both recommend annual screening beginning at age 40. Some women are afraid to have a mammogram because they are worried they may have cancer, and women previously diagnosed with breast cancer have an increased fear. After the initial screening, some women may receive a callback or a letter stating that an abnormality has been detected and needs further evaluation. According to radiologist Kerri Hesley, M.D., of Associated Radiologists, most patients recalled do not have breast cancer. Some women have dense breasts that have more glandular than fatty tissue and make it more challenging for radiologists to interpret. A lump found could be a cyst—a fluid-filled sac. In either situation, the radiologist may want more pictures of your breasts, an ultrasound, or further testing. In the vast majority of callbacks, says Dr. Hesley, it’s benign or normal tissue. To stay committed to regular mammography screenings, it also helps to have health insurance. According to the American Cancer Society, coverage of mammograms for breast cancer screening is mandated by the Affordable Care Act, which provides that these be given without a co-pay or deductible beginning with plan years starting after August 1, 2012. But, grandfathered health plans (in place before the law was passed) are covered by state laws, which vary, and other federal laws. Check with your insurance carrier on coverage guidelines. Women shouldn’t have to make a choice between caring for their families and caring for themselves. The Make a Difference Breast Cancer program is a breast cancer outreach, education and screening project that provides services to uninsured and underinsured women of Washington County and the tri-state area. Nurse practitioners perform breast exams and explain how to conduct self-exams. If a patient requires a mammogram, a breast health navigator makes an appointment at a radiology lab often on the same day or soon after. 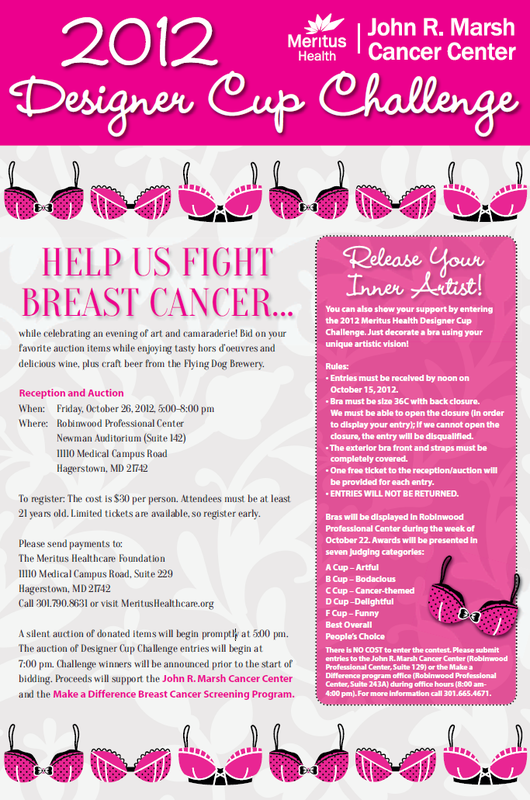 Breast-screening clinics are offered throughout the county several times each month. Grants, local programs and contributions by John R. Marsh Cancer Center and Diagnostic Imaging Services fund Make a Difference. To help keep this critical program running, the Meritus Health Designer Cup Challenge, an auction and reception, will take place on Friday, Oct. 26. 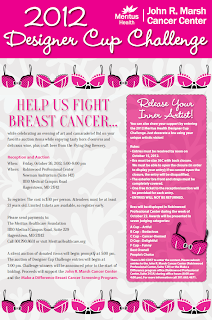 “Bra art,” created by some very artsy people, will be on display as well as donated silent auction items. You can enjoy a night of art, appetizers and cocktails knowing that proceeds go to the Make a Difference Breast Cancer program and the John R. Marsh Cancer Center. Remember, annual mammography is important because some tumors are so small they cannot be felt—and survival is greater when you catch the disease early—before symptoms are present. So when you see pink this October, pick up the phone and schedule your mammogram, and if that task is already checked off your list, give a gentle reminder to a woman you know.